In this class we will work together using the wheel to make simple cups, mugs, and bowls, and move on to more complicated forms such as pitchers, covered jars, teapots, and large-scale work made by joining sections. Mark will demonstrate throwing technique, making handles, and decorating. We will think about what makes a pot engaging, pleasant to use, and expressive, with the intention of sparking development in our own work. The town is sacked. Silver and gold, even bronze, are beaten into crude billets to be hauled off and melted. Houses burned; prisoners taken, or not. And in the wreckage: bones, stones, and pot-sherds. Clay’s low material intrinsic value and fragility, ironically, make it endure as one of the most compelling records of the human touch on the earth. The bottom of the ovoid jug is marked by the potter’s two- hundred-year-old fingerprints, just as the earth’s strata are uniquely marked in clay fragments by all the peoples who struggled here to endure. Where will my pots end up? In the landfills with the lawnmowers and TVs and silicon chips—the giant middens of our insatiable desires? No matter. I am glad just to leave a record of my own touch in this most receptive, fragile, and enduring material. Mark Shapiro makes wood-fired pots in Western Massachusetts. He is a frequent lecturer, curator, panelist, and writer, and is mentor to a half-dozen apprentices who have trained at his Stonepool Pottery. Karen Karnes (UNC Press 2010), which accompanies her current traveling retrospective. 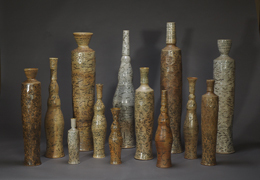 He is on the advisory board of Ceramics Monthly, and is a contributing editor to Studio Potter Magazine.